We Made 3 Hits – Reekado Banks. You may be thinking who and Reekado Banks did the 3 Hits. 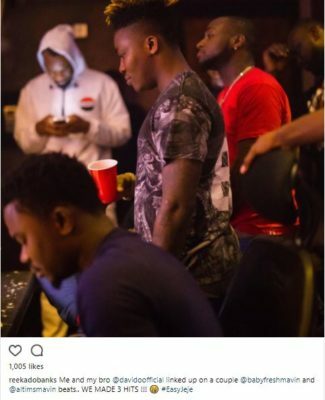 Well, some days ago, A video showing Davido in a studio believed to be owned by Mavins records, appeared on the internet and it seems OBO was in the studio with Reeky, creating what could turn out to be hit songs. Regarding the collaboration, Reekado took to his IG to post about it. Below is what he said.